Free your team from the trap of compliance audit surges. Few companies look forward to an audit, but it’s an essential and thorough part of testing security controls. Performing an audit is a demanding, resource exhaustive, time-consuming process that would pause operations until the auditors were finished. The upside was most audits were seasonal and a one-and-done process. However, with the recent advances in technology and degree of consumer protections, what was once a seasonal event has turned into a near-daily routine. 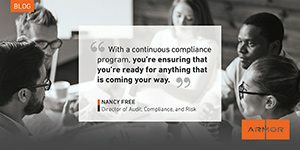 The list of compliance standards and their hundreds of seemingly unique requirements continue to grow, placing a strain on tried-and-true compliance processes. Those companies who could manage change quickly were able to shift and adapt. They turned their compliance approach into a full compliance program by consolidating controls across multiple regulations and standards, automating control executions wherever possible. Companies that couldn’t adapt in time were met with a surge of compliance demands that would lead to lost productivity and overall company confidence. Luckily, Armor has devised a way to break-out of the compliance surge and into a continuous compliance program. Learn more about the continuous compliance workflow by reading our, “Farewell to Audit Season” white paper.